High efficency, compact constrution and superb reliability are core requirements for our modern circulation Pumps and Valves. 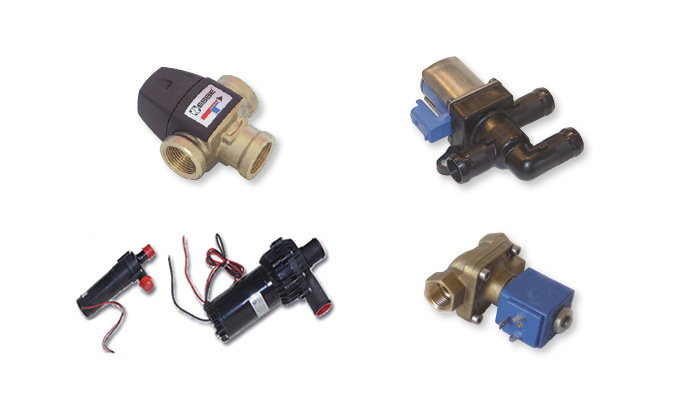 Magnetic valves from leading brands such as Danfoss, Sms-Tork, Bosch, Wabco and more. Available in 12V and 24V, N/C and N/O. Brass fittings 16mm and 19mm available. Max system pressure 2,5 bar. Glass reinforced plastic, stainless steel. Motor protection IP 67. Typical application: Circulation of water/antifreeze in heatingsystems for various kinds of vehicles, circulation for cooling fresh water in vehicles.